Without a commitment to lowering costs associated with advanced residency, tuition price freeze means little for potential students. Provost Thomas Rosenbaum should begin to draw down the increasingly high Advanced Residency (AR) fees that many Ph.D. students pay beginning in their sixth year. These fees are now over $6,000 a year, and on track to surpass $7,500 in five years. Since 2007, Rosenbaum’s cumulative policy decisions have increasingly discouraged poorer students in many departments from adequately professionalizing, which in turn hurts students’ job placement, as well as the University's intellectual influence and prestige. It would be unfortunate if Rosenbaum’s tenure and Robert Zimmer’s presidency were defined by the creation of “two tracks” of Ph.D. students in many programs in the Humanities and Social Science Divisions and the Divinity School: those with independent money who can afford to adequately professionalize, and those poorer students who cannot. The visionary Graduate Aid Initiative (GAI) of 2007 let UChicago catch up to its intellectual peers by offering most Ph.D. students five years of guaranteed funding. However, an “academic arms race” has dovetailed with steadily rising AR fees and produced conditions in which UChicago is again falling behind its peers with every passing year. The recent economic collapse further reduced the number of tenure-track jobs while increasing the competition for them. Accordingly, the level of recommended professionalization has also increased. Although details vary with program, a rough consensus has emerged among many professors, from here or elsewhere, who appear at UChicago-sponsored professionalization events and write in The Chronicle of Higher Education. What’s recommended for a good job? An ambitious dissertation, a demonstrable secondary research specialization (perhaps involving another language), at least one article (ideally in a refereed journal), and attention to pedagogy resulting in one or more substantive, student-created classes (ideally taught at other institutions and in areas that “push” the boundaries of a student’s academic identity). What do all these have in common? Time—and time is money, in the form of AR fees. Rosenbaum has recognized, but not addressed, the problem of high AR fees. Back in the 2006–2007 academic year, he responded to widespread student concern by convening a university-wide committee under then Deputy Provost Cathy Cohen. That committee of deans, professors, and students (including myself) ultimately validated student concern and recommended lowering student fees, since they entailed counterproductive work-loan “burdens.” Due to the economy, however, the Provost chose one fee, out-of-pocket AR tuition, to hold constant—which amounts to a decision to let total fees, and thus the counterproductive work-loan “burdens,” continue to rise. When students complained in 2006–7, the basic bundle of fees was $4,602, but that bundle is now $6,039 (up 31 percent from when students first called attention to the problem) and is on track to reach around $7,700 within five years (an increase of 40 percent). Even working at UChicago to support professionalization has become increasingly unfeasible under Rosenbaum’s tenure. 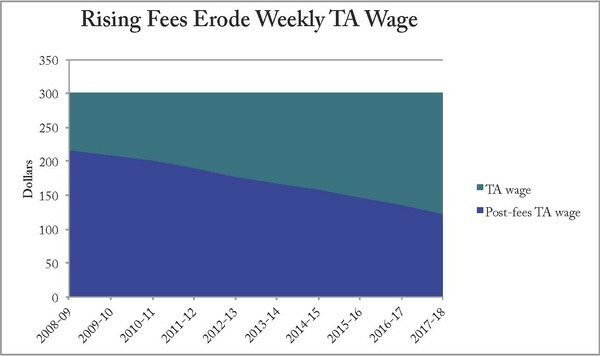 On the one hand, rising fees have steadily eroded the one-time teaching pay raise of 2008–2009, to the point that this year’s student TAs effectively make 18 percent less than just four years ago—an effective pay decrease of almost a fifth of their weekly pre-tax income. On the other hand, what if a poorer student cannot secure teaching and thus AR tuition remission? Part-time non-teaching jobs of $12–$14 an hour now see an astounding 71–83 percent of weekly wages going to meet high fees. On top of all this, the 2011 federal debt ceiling deal severely restricted loan subsidies, forcing grad students into loans that accrue interest immediately. Some prospective Ph.D. students are already choosing not to attend UChicago. Anecdotally, two of three recently admitted students turned down offers from a language-heavy subfield of the history department. Why? Campus visit conversations with GAI students currently in their sixth year led them to look beyond initial funding and academic quality and recognize that the policies of peer institutions would better permit professionalization once they inevitably entered AR. Thus, such desirable candidates will never bear the UChicago imprimatur—nor will they ever offer us their questions, which often emerge from their unique socioeconomic and cultural backgrounds. Conversely, those poorer students already at or who will enter the University increasingly graduate to no jobs or less prestigious jobs because Rosenbaum’s policies erect ever-higher barriers to professionalization. Yes, some students may snag a top job with just the strength of their dissertation, but the overall result of Rosenbaum’s policies is clear: a University that is wealthier, less intellectually vibrant, and less prestigious. The GAI was an important achievement, but its vision has not yet been fully implemented and fades with each year. Deputy Provost Deborah Nelson’s efforts to encourage early language study and improve advising are important, but are not commensurate with the magnitude of the problem. The Affordable Care Act’s effects are unclear and may help some students, but international students will surely be excluded. Thus, with no real solutions on the table, the University’s own policies are increasingly frustrating its investment in graduate students. Rosenbaum should revisit his continuing choice to let AR fees rise, and begin to draw them down for the good of the University. David Mihalyfy is a seventh-year graduate student in the Divinity School’s History of Christianity program.